Heard much about AIDS lately? Barbara:Ask me if I’ve heard about anything else. Really? So your friends talk about AIDS? Barbara: No, no one does. But, you said you haven’t heard anything else. Barbara: That’s because it’s in the paper and on TV all the time. If AIDS is so important, why don’t your friends talk about it? Barbara: I guess they’re embarrassed. Barbara: AIDS isn’t exactly what you’d call party conversation. No, it’s no party. But how are we ever going to prevent AIDS if we can’t even talk about it? 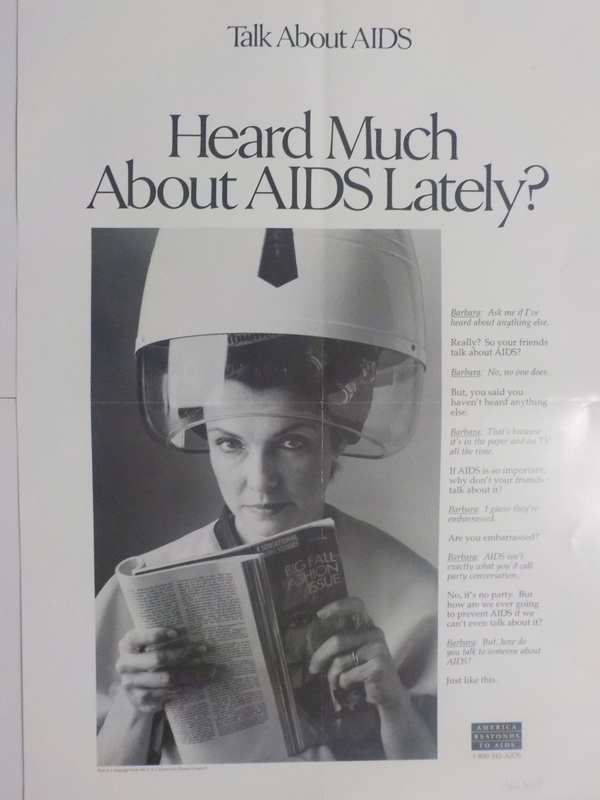 Barbara: But, how do you talk to someone about AIDS? This is a message from the U.S. Centers for Disease Control"
Order number: P077 (English). CDC National AIDS Clearinghouse, Catalog of HIV and AIDS education and prevention materials September 1994, p. 13. A midde-aged woman emphasized the importance of talking about AIDS. Talk about AIDS, Have you talked with your wife about AIDS?